A cream charger starter pack contains everything you need to get the most out of your whipped cream dispenser. When you purchase a starter pack you can be assured that all of the components are compatible and take advantage of savings in shipping and delivery costs. This starter pack contains 200x 8gm cream chargers and a 0.25L dispenser. The nitrous refills (chargers) are our premium quality brand and the dispenser is available in a choice of colours. Whipped cream dispensers transform standard cream (whipping or double) into lavish whipped cream. The volume increases by approximately a factor of three during this transformation – which gives you a much lighter product than you would achieve by using the traditional method of a balloon whisk. This is because of the special properties that the Nitrous Oxide gas imbues upon the cream as it dissolves and then expands in the liquid. This dispenser is 0.25L in size – so will triple the amount of cream to 0.75L when used fully. This is a hardwearing dispenser but is not suitable for heavy-use professional catering environments, for professional use we recommend one of our stainless steel “professional ranges”. This whipper is suitable for use with all conforming 8gm chargers – which is the majority of brands (but not Kisag) . It accommodates all of the brands of 8gm charger we sell. The silicone head gasket (seal between dispenser body and head) tolerates temperature extremes. 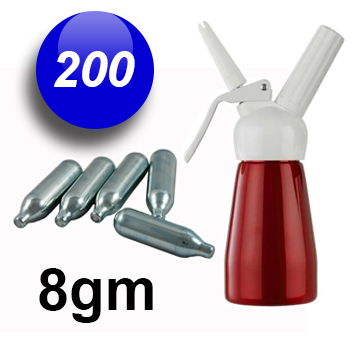 High quality nitrous oxide charger refills: for use with the supplied dispenser or any compatible brand of 8gm whippers. 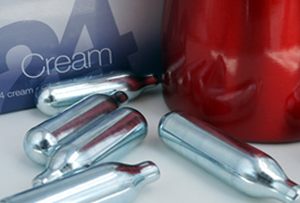 The nitrous oxide contained within these is high grade and 100% pure, food safe. It will not impart any flavour upon the cream as it whips it. With the two items contained in your starter pack the only other things you need to make whipped cream are the cream itself and flavourings (optional). To begin with it is advisable to rinse out the whipped cream dispenser before you use it for the first time. Then allow it to dry. You are now ready whip-up a treat! Pour as much or as little of the cream into the body of the whipped cream dispenser as you require. Do not overfill the chamber. You can also add a flavouring or additive to the cream at this time. Liquid flavourings or cordials can simply be poured in, however any flavours that contain solids or otherwise require dissolving might need to be mixed or agitated prior to filling. Place one of the disposable whipped cream chargers into the charger holder. Screw down the charger holder – this will perforate a small hole in the 8gm nitrous oxide canister and allow it to escape into the vessel. You will hear a hissing sound as it does this. 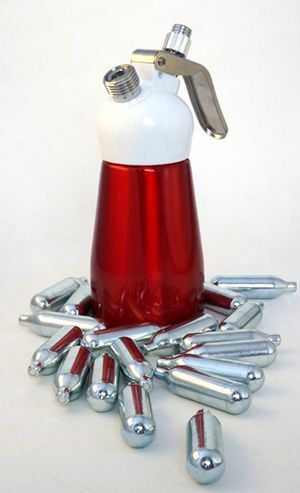 The sound is caused by the nitrous oxide gas expanding into the body of the whipped cream dispenser where it is forced into a solution with the cream. One property of the inert nitrous oxide gas is that it will dissolve into non-polar liquids such as the fat molecules in the cream (butter-fat) which is why dairy products with a relatively high fat content are required (whipping or double). Indeed cream with too high a fat content will in fact dissolve too much of the nitrous oxide gas making it too thick to actually pass out of the dispensing nozzle! You are now ready to release your cream – but it is also safe to leave it stored with the nitrous oxide gas dissolved in it until required. After you have finished please dispose of the recyclable nitrous canister safely. Each cartridge is under great pressure. Always use in accordance with manufacturers instructions. This is a non-aerosol product. 100% Steel – fully recyclable. Pressurised volume 10 cm3. Contains 8gm Nitrous Oxide UN1070 (E942) under pressure. Gross weight of cartridge - 28g. Colour - Silver. Do not pierce. Never dispose of full cartridges. Keep out of reach of children and under 18s. Explosion danger - 50C max temperature. Whipped creams are the latest trend on the food market as they are fashionable yet delicious enough to set an alluring memory in our taste buds. Various online resources can be found about the cream charger and its benefits of use but there is an extreme lack of information about the product itself. So whether or not you have a cream dispenser seating in your kitchen, it’s a necessary task for you to know about its quality and build to use it even more correctly. Now in the modern age of science, if you know the procedure of how your own gadgets or products work, this will become quite an effective knowledge for future purposes. It’s a bottle shaped product, made of metal along with detachable head that consists of various shapes and sizes in order to make different shaped cream toppings. It’s the main part of creating creams, all the parts are exchangeable meaning that if any part is broken it can be changed and reused again thus making it cost effective. Build of the product is quite strong with stainless steel, looks also attractive because of having glossy finishing. Many often overlook the fact that a cream dispenser containing cream can be kept in the refrigerator not more than fourteen days. 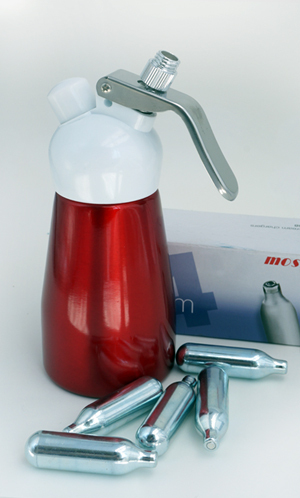 Dispenser is used along with cream charger consisting of nitrous oxide which is lightweight and easily portable unlike any other tool. Mainly you can add any flavor and create different types of recipes of your own using the device. Only two basic items are needed in each recipe, one is heavy cream and other is sugar if necessary. Otherwise flavors, juice or any other item can be mixed within it and put inside the dispenser. Charger is discharged into the device with N2O which combines with the mixture to create fluffy, soft creams. European brands are one of the best producers of cream chargers so you should opt for buying from authentic European sources if possible to get the best whipped creams. An awesome, great value deal. I was looking at some of the whipped cream charger kits available and some of them only have as few as five chargers included with the kit - in particular the molecule-r kit. So I grabbed one of these because of the value. The next day delivery was pretty useful too because I'm not the sort of person to plan too far ahead for anything!